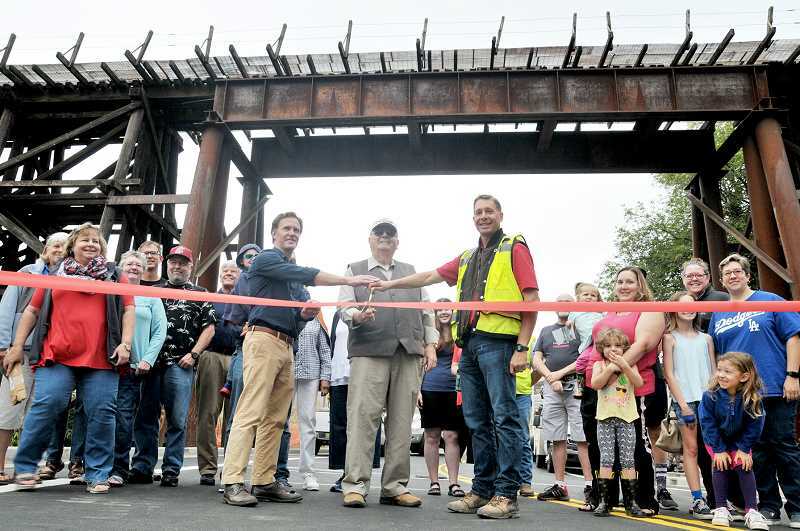 The city celebrated the nearly-finished renovation of Villa Road with a ribbon-cutting ceremony Friday as dignitaries and the public alike got a look at the realignment of the road, the installation of bike lanes and the addition of sidewalks. "The road will be open," city engineer Kaaren Hofmann said. "They've got some landscaping that they still need to do and some follow-up stuff, but the majority will be done and cars will be able to use the road. I am overall feeling very good about the project." 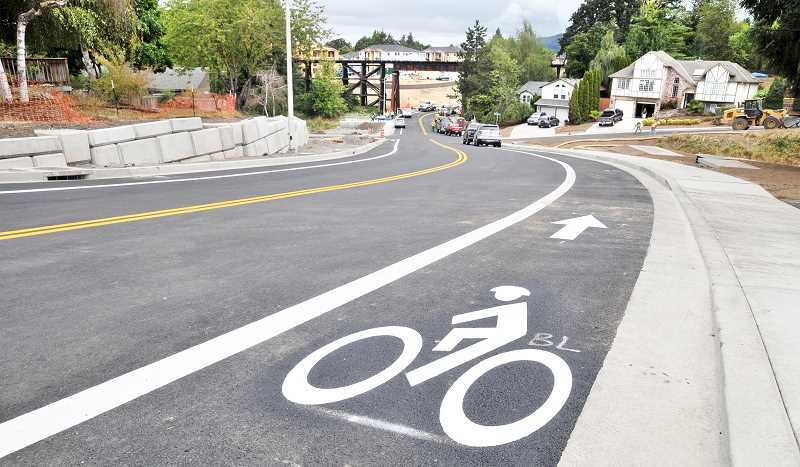 The second phase of the project included relocation of utilities to below ground and the addition of 3,200 feet of continuous sidewalk and bike lanes. To preserve the feeling of a countryside, the street will be lined with more than 3,000 shrubs, ground cover and 31 oak, ash, alder, willow and cedar trees. "The weather has been so hot to try and plant anything right now," Hofmann said. "They will get it in the ground in the next several weeks. The sidewalks should be all the way done; the only piece that might not be complete yet, is they are still working on the pedestrian canopy underneath the railroad tracks. It took a little longer to get some permits than what we planned for." The canopy over the sidewalk beneath the trestle is to prevent someone from getting injured if something fell from the railroad tracks. Flashing beacons are located at both ends of the realigned road to provide safer crossings for pedestrians as well. A lack of driver visibility for automobiles, bicyclists and pedestrians was the impetus for reconstructing the stretch of Villa Road. In 2013, the city and George Fox University tried to purchase property in the area to address the safety issues, but at issue was easement for a stretch of sidewalk near Laurel Drive. In 2015, after discussions with the owner of the property, the city acquired the right-of-way. Two ancient oak trees were felled on Villa Road to make way for the re-designed road and construction of an apartment complex nearby. Another tipping point to kick off restructuring Villa Road was the city approval in summer 2015 for a change in zoning to allow construction of an apartment building called Martell Commons. In 2016, the developers of the apartment complex met with the city for a pre-application conference to discuss development of a 140-unit complex now called Chehalem Point Apartments. With concern over increased traffic and the safety on the busy road, the city insisted the apartment's owners help pay for their "fair and proportionate share" of the Villa Road improvements. The owners agreed and the plan was approved by the city council in November 2017. Construction of the apartments began in February and it is estimated the complex will generate 972 average daily trips and around 95 trips during the weekday rush hour. As a result, the city installed a left turn lane to enter the complex to help keep the traffic flowing. In addition, a three-way stop sign will be installed at the corner of Fulton Street and Villa Road to handle the expected increases of traffic. "The hope is that it will help with the flow of the traffic once the apartments come in," Hofmann said. "We will have to see what it is going to look like." Once all the setbacks were wrapped up phase one of construction was completed in October 2016. Phase one replaced two culverts that carry water under the road. One culvert is beneath the train trestle and contains Hess Creek. The other culvert carries storm water away from the road and addresses the regular flooding of Villa Road in the winter. "We've had a lot of deer that are still living out there and wander up into the construction zone and hang out," Hofmann said. "If the deer are wandering (that will be a concern from a traffic standpoint). The culvert is large enough that they can get through it. They have to work a bit to get into there, but a neighbor said that they saw some in there."